Most smartphones you can buy nowadays can seriously burn a hole in your wallet. That’s one of the reasons why owners of new smartphones treat their device like a fragile baby. Of course, you also love your phone for its features and hardware. But as it might happen with all kinds of small things, your beloved smartphone is constantly exposed to the risk of being lost or stolen. I know, shocking, but that’s the cold hard truth! You occasionally lose things and, well, thieves do what they do. Making your phone trackable and secure is the best way to prepare yourself for such situations. Of course, it’s unlikely that you’ll lose your phone, but better be safe than sorry. Note: If you also own an iPhone or iPad, there’s also an easy way to track it down, in case you lose it. Although there are ways to track your Android phone without installed tracking apps, being prepared for the worst gives you a great advantage and a high probability of recovering your baby, mistress or whatever you call your smartphone. That is the most obvious step here. 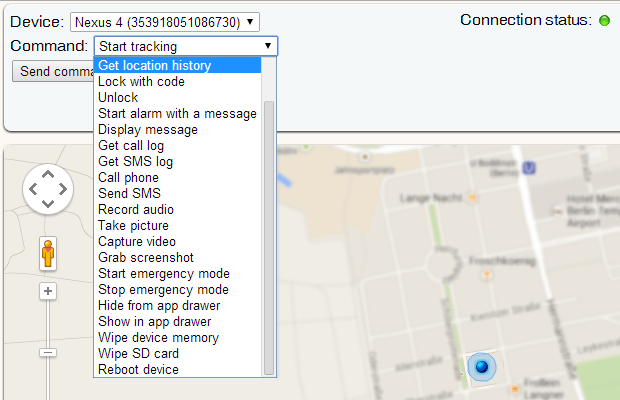 If you want to be able to track a lost phone, install some sort of tracking app, duh! I highly recommend the anti-theft app cerberus (Play Store link). It is easy to set up and offers a wide range of features. Besides tracking your device using your browser, you can lock or wipe it, display a message on the screen, take images or videos with the front or back camera or start an alarm sound. Another great feature is the ability to hide the cerberus app in your app drawer, so that it can’t be seen by thieves. Alternatively, you can install a disguised version of cerberus. In that case, it will appear as “System Framework” in your app drawer. Cerberus offers even more features but these are the ones you probably need most. You can try out cerberus one week for free before having to pay $4. It’s totally worth it! Just compare it to having to buy a new phone. In case your phone is rooted, you can even flash cerberus into your ROM. It will turn your phone in your own personal NSA fortress. Being deeply integrated in your system, cerberus is able to survive even a factory reset. Having Dropbox’s Camera Upload option enabled can come in handy in case cerberus isn’t able to connect to your phone at all. Camera Upload basically uploads every taken picture to your Dropbox folder. Why is that useful? Because a potential thief might take interesting pictures with your phone that might help you identifying the person or the phone’s location. Having an unlock pattern or password can be quite annoying if you tend to unlock your phone a lot. However, besides keeping your data safe from other people, it also hinders thieves to check out your device and uninstalling any anti-theft apps they discover. Also, it makes it much harder for them to disconnect your phone from your Google account which is critical if you use tracking tools such as Google’s Android Device Manager. You can create an unlock pattern in your security settings. Being stuck on your lock screen, a thief can still do one thing without a problem: turning off your smartphone. There’s no way to track your phone if it’s turned off! Thankfully you can make it a little bit more difficult for the thief. Installing an app like Smart Lockscreen Protector will block the power menu option so that no one can turn off or mute your phone. Although, there’s still the possibility to turn it off by pressing the power button for a long time, it might take a thief longer to figure that out. That’s more time for you to track down your phone. Find out your phone’s IMEI number and write it down. This number can be used to clearly identify your phone. Also, if you tried everything but weren’t able to track it down, you can ask your carrier to put the phone on the GSMA IMEI blacklist. This will make your phone useless because it won’t work with most carriers anymore. And if you, miraculously, retrieve it you can always take it off the blacklist. Setting up your phone using the above steps doesn’t need much time at all and can save you a lot of trouble. I recommend that you follow these steps as soon as possible. After all, you could lose your phone later today.